Interests:All aspects of angling, shooting, classic motor bikes and motor racing. The fresh green of spring has now given way to the dog days of summer on my little river and the trout are mostly holed up under the overgrown banks, the larger fish preferring to raid the plentiful supply of minnows, than take a fly. Sport can still be had on the fly, but the river has come alive with small dace and chub and even a cast to an observed trout often results in a splashy take from a dace. This chub is the best I've taken on any method and had been dimpling on the surface like a much smaller fish, until I set the hook, then it exploded into life. On a 7ft, 4/5 weight rod, this was not a one sided fight. After a short rest, it zoomed back to the pool. Now the back end of August, I'd been preoccupied with roach and carp and had neglected my flyrod for a while and a visit to my local trout stream was overdue. The river was running clear with a good flow, but the larger trout were keeping well hidden, or were no longer there. There were plenty of dace about though. 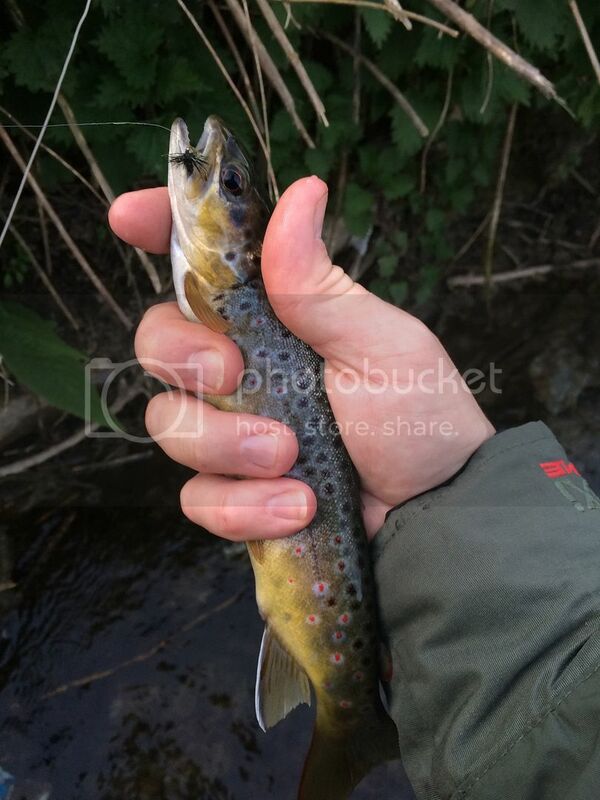 This plump wild brown gave good account of it'self, having taken a size 18 gold head Hares Ear nymph. The lack of rain and the sight of the river running over the stones, kept my fly rod in the shed, until the pace picked up following a few days of showers. Only days before the end of the trout fishing season, I returned to a previously productive stretch, hoping for some good memories to see me through the winter, but after after a blank half hour, I was dismayed to catch a small wild brown that had been mauled by a mink. With a set of fresh teeth marks on the other side of this trout, I wondered how it had escaped the mink, also how it continued to feed, while giving a good account of it'self, when hooked. Downstream of this stretch last year, I watched a mink swim downstream past my feet, then go on to chase and catch a pound plus brown trout in the next pool. We have two mink traps and a number of crayfish nets, which have accounted for several mink this season, but it's depressing to release a trout knowing that it may soon be a mink's next meal. The 2015 season on my Hampshire syndicate chalk stream began well this week, with a healthy wild brown trout on my third cast. The previous two seasons have followed flooded winters and a slow start for most members, but no floods, mild weather with lower levels, resulting in a clear river, bode well for the spring. This perfect brown took a nymph, fished along the edge, the only rising fish being dace. I started my hunt for a Thames trout on the fly yesterday. Challenging conditions with wind and rain, and no touches, but the stretch of river looks lovely. Realistically, even on the river I fish with lots of trout it can be hard going for the first couple of weeks. Hi Steve, How far up are you on the Thames? There are a lot of trout in the Thames, but they are outnumbered by chub and dace below Lechlade on the fly. There used to be a few taken each year in the weirs between Windsor and Maidenhead on spinners and live baits, I caught two, a poor result considering the number of chub, pike and perch I also caught on the above methods. On my trout stream, if you have followed this thread, you'll see a fair few chub and dace. I even caught a roach on the fly. I'm right at the top, near Cricklade. I was pestered by them while chub fishing further down near Lechlade, but I'm keen to get one on the fly. The section I was chub fishing I'd need to ask permission to fly fish in the coarse closed season, whereas this section explicitly allows it in the rules. The Thames at Cricklade has masses of character, I would think that once the weather warms up and the Hawthorns and Mayfly get going, you will be able to cast to individual trout. Twenty years ago my Windsor fishing club fished a knock-out competition against Swindon Talisman and beat them at Cricklade. During practice, I had several on the stick float, while in the match, I fished a waggler with maggots and had half a dozen browns to a pound. We couldn't weigh them in. They fought like the clappers compared to the 8 to 12 oz chub I was catching. I also drew Lechlade in the Thames Championship, fishing below the Coln confluence, again on the waggler with maggots. More trout among my chub, including a big rainbow, that broke my 1.7lb hook link at the net. As I said, plenty of trout up that far. My membership of a club on the Kennet allows fly fishing after April 1st and will give that a serious try this year. My last coarse season session put a 12 inch brown and a decent grayling in the net. Maggots again! There has been a big increase in the number of trout in the river since the 2007 floods - 15 fold increase in EA surveys. I've had one trout from the Cricklade section perhaps ten or fifteen years ago, trotting in the summer, but over the last few years I've caught increasing numbers of them further down near Lechlade while fishing flake in the winter for chub. I had half a dozen of them one day this winter. If I get dispirited, I have access to a Bristol Avon tributary which is a lot easier! First trout of the season, though not from the Thames.